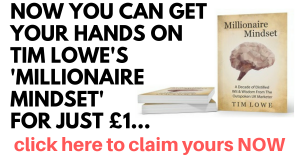 It has been said that the only constant in our lives is change – and it’s true that there have been some massive changes for those who want to make extra money online … in both the tools we use and even the most profitable methods to get results. I’ve said many times recently how it has become relatively simple to get a good looking website up and running within a day – and be able to do so very cheaply. There’s no more approaching some ‘odd but interesting’ type to work some sort of alchemy in the corner of a darkened room over the space of a couple of weeks and then having to part with a small fortune just to get the most rudimentary of sites up. You can do it yourself in a matter of hours – or get someone on Fiverr to do the hard bits for you for very little. It’s the same with how we actually make money online as well. Changes in technology and attitude has meant that many things have become more accessible and in fact quite commonplace over the last couple of years. In fact there’s a way of making money that is quickly overtaking all of the others – it doesn’t require any stock or premises, or even one of those easy to set up websites Ive mentioned above. Most importantly for a lot of people, it doesn’t involve having to sell anything to anybody and it is already been used to great effect by many every single day. It is for this reason that – over the last couple of years – a lot of my own focus, and the time and effort of my team here at HQ has been dedicated to research and refinement of systems in this particular field. I am of course talking about Sports Trading. I’ve said it before – and I suspect I’ll have to say it again – Sports Trading is not ‘gambling’. Gambling involves sitting there with everything ‘clenched’ – sweating on the all or nothing outcome of an event you have absolutely no control over. Clearly this is a very bad idea, and I can understand why people might want to avoid this like the plague. Yes, like gambling you need to place a bet (according to certain criteria of course), but then at later stage or after a certain event you then ‘sell’ that bet to secure your profit. So, unlike gambling, the outcome of the event is irrelevant to you making a profit and you have a level of control. The realisation that this way of making money is in no way dodgy has lead to a horde of people jumping at the chance to get involved. It’s easy because it now involves just a couple of websites and has nothing to do with a bunch of suspicious looking characters in sheepskin coats with 20 Woodbines tucked in the top pocket looking at the world over the top of a slightly besmirched Racing Post. 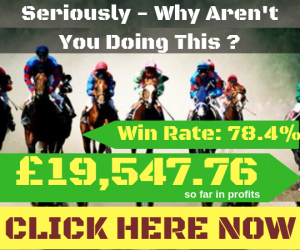 So, if you’ve not got at least one Sports Trading strategy in your money making arsenal, not only are you missing out … you’re getting left behind. If you haven’t got started in this particular area just yet or for some reason got started and didn’t take it any further – then keep an eye on your letterbox or inbox over the next week as I have something very special for you..